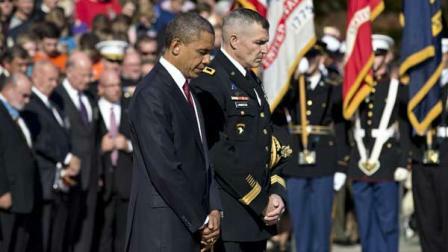 November 12, 2012 (LOS ANGELES) — From sea to shining sea, the nation paid tribute to its members of the armed services Sunday. In California, a long legal case drew to a close as a war memorial cross that had been deemed unconstitutional was being resurrected Sunday in the Mojave desert, capping a landmark case for veterans fighting similar battles on public lands. Sunday marked the official commemoration of Veterans Day, but the federal holiday will be observed Monday. President Barack Obama laid the wreath at the Tomb of the Unknowns at Arlington National Cemetery in Virginia and noted that this is the first Veterans Day in a decade with no American troops fighting and dying in Iraq, and that a decade of war in Afghanistan is coming to a close. In a speech at the Memorial Amphitheater, he said America will never forget the sacrifice made by its veterans and their families. Later, the president and his wife, first lady Michelle Obama, and Vice President Joe Biden and his wife, Jill, greeted families in the cemetery’s Section 60, home to graves of service members killed in Afghanistan and Iraq. In California, a war memorial cross that once stood on a rocky hilltop in a national park before being deemed unconstitutional and ordered removed was being resurrected in the stunningly stark Mojave desert, marking the end of a longstanding legal dispute that had become entangled in patriotism and religion. Henry Sandoz, who cared for the original cross as part of a promise to a dying World War I veteran, will rededicate a new, 7-foot steel cross on the same hilltop. The site is now in private hands as part of a land swap with the National Park Service that ended the legal battle. The donated land was owned by Sandoz and his wife, Wanda, of Yucca Valley. Sandoz has cared for the memorial as a promise to World War I veteran Riley Bembry, who with other shell-shocked vets went to the desert to help heal and erected a wooden cross on Sunrise Rock in 1934. It was later replaced with a cross made of steel pipes. Then Sunrise Rock became part of the Mojave National Preserve in 1994, putting the Christian symbol on public land. The American Civil Liberties Union filed a lawsuit in 2001 on behalf of a retired Park Service employee who argued the cross was unconstitutional on government property because of the separation of church and state, and federal courts ordered it removed. Storm-ravaged New York hosted the country’s largest Veterans Day parade with turnout sparse along portions of the 30-block route along Fifth Avenue. Standing in warm fall sunshine, officials said veterans should be honored and remembered more than just one day a year. “This nation has a special obligation to take care of you,” U.S. Deputy Secretary of Defense Ashton Carter told the crowd. Several officials also made a note of mentioning Vietnam veterans. This year marks the 50th anniversary of the Vietnam War. Along a number of blocks of the parade route, just a few dozen spectators were lined along the barricades. In an event befitting the nation’s movie capital, the GI Film Festival Hollywood was launched this weekend in Los Angeles. Films at the two-day festival highlighted the successes and sacrifices of American military personnel and the worldwide struggle for democracy, said festival co-founder Brandon Millett. Movies must have at least one main character, real or fictitious, who plays a military role with respect. The festival’s mission is to preserve the stories of American vets, he said. The festival showcased eight feature films culled from Millett’s annual GI Film Festival held in Washington, D.C., in May, and debuted short films made by filmmakers who are veterans. It also recognized actors for their contributions to the U.S. Armed Forces and held a fundraising auction to benefit the Semper Fi Fund, which aids wounded Marines and their families. Chicago’s National Veterans Art Museum unveiled its latest exhibit called “Welcome Home” as it celebrated its grand reopening in a new location. A Las Vegas casino rolled out the red carpet for some 60 injured veterans in a special Veterans Day weekend trip. The annual “Salute to the Troops” weekend started with free American Airlines flights for veterans and their guests and a welcoming committee of MGM Resorts employees Thursday. Employees held welcome signs, waved flags and chanted “USA” as the honored guests arrived. MGM Resorts is hosting the veterans free at the Mirage Hotel and Casino, and treating them to a variety of attractions and shows during the five-day trip that ends Monday. Genealogy website Ancestry.com has launched an online, searchable collection of the burial sites of more than 500,000 members of the military. The project, a partnership with the U.S. Department of Veterans Affairs and the National Archives and Records Administration, allows people to search by name, for a fee. The collection includes burial information for prominent figures in history, including President Abraham Lincoln and Gen. George Armstrong Custer, who was killed with more than 200 of his men in the 1876 Battle of the Little Bighorn against a coalition of Native American tribes. The project includes two new, searchable collections of U.S. burial registers, military posts and national cemeteries from 1862-1960 and of U.S. headstone applications from 1926-1963.